The great outdoors are meant to be enjoyed. High-quality outdoor furniture is an easy way to turn a yard into a functional and relaxing space. Whether you’re planning an overhaul of your property to are just looking to add a piece to your existing space, we’ve got you covered. We offer both custom-made and order-made options to suit your needs and tastes. Our customers get what our customers want. Clients often ask for custom furniture for both their outdoor and indoor spaces, and we were happy to accommodate by creating Architectural Landscape Design, Inc.’s newest division. Like everything else we do, our stone furniture is created with custom craftsmanship. Stone furniture adds a natural and attractive touch to landscape designs, but stone-cutting is quickly becoming a lost art. We want to preserve stone-cutting techniques, so we use both traditional and modern methods to create custom furniture pieces that are both beautiful and practical. Just like our landscape designs, our work is 100% custom designed. We believe that the best designs are achieved through collaboration with our clients. Designing a custom piece of furniture may require a bit of give and take between a client’s wants and needs, and the stone chosen for the job, but we are committed to working with you to choose the best materials for your ideas. Let us take your vision and combine it with our artistic flair and stone-working expertise to create a unique piece of furniture you’ll love. Stone furniture not only looks great, but it’s hard, strong and durable. Our creations will withstand both changes in weather, harsh conditions and frequent use. You won’t have to worry about treating wood to prevent rot, being burned by metal surfaces that have been baking in the sun, or plastic that discolors and becomes brittle with age. We strive to build stone furniture and home accessories that will last for generations to come. Why pay extra for expensive stone from other parts of the country when we have great resources right here in Minnesota? We hand select all of our raw stone from local quarries. Not only does this provide a number of options in color and look, but saves you money on transport and import fees. We are proud of our work, and we can’t imagine outsourcing the vision you’ve entrusted to us. We want to see your project through from start to finish. Our one-of-a-kind custom stone furniture is hand crafted at our shop, located just south of the Minneapolis/St. Paul metro area. Creating in-house means we can get your piece out of your head and into your yard that much faster. If you you’re looking for a dramatic piece that will spark conversation, look no further than our “Elements” Fire & Water table. Whether you use it in your yard, your home, or your bar or dining business, your family and guests will be amazed and entertained while sitting around this ALD original. We recently introduced our second generation model at the Minneapolis Home + Garden Show, and the response was fantastic. 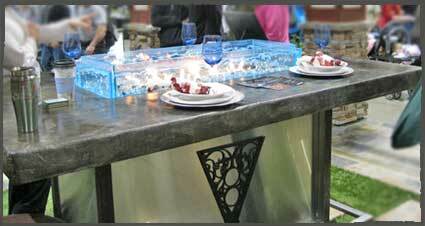 This bar-height stainless steel and granite topped table can seat 10-12 people and features a central gel-based fire pit surrounded by Plexiglas filled with bubbling water. From sitting height, the fire appears to be right inside the water. Imagine the conversations you’ll be having while you sit around this ALD exclusive table. The granite tabletop and the Plexiglas center are made to order. We can create almost any shape you can imagine, so don’t be afraid to get creative with your custom table. We also fit each table with remote controlled LED lights for a more colorful night look that’s sure to mesmerize your guests. Safety is, of course, a concern wherever fire is involved. Our Fire & Water table was designed with safety precautions in mind. The Plexiglas barrier keeps the fire contained, making it safe for both indoor and outdoor use. Water recirculates through a hidden cooling system under the table, keeping the Plexiglas cool to the touch so you won’t accidentally burn yourself. Even better, that same cooling system can be made to harnesses the heat from the fire and radiate it outward from under the table, keeping you and your guests warm and toasty on even the coldest Minnesota nights. 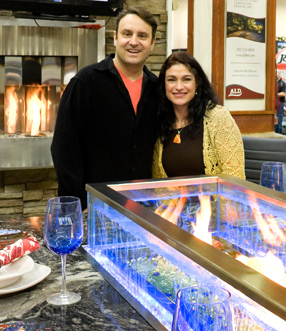 We are extremely proud of our design and the patented features that make the “Elements” Fire & Water table stand apart from other fire tables sold by our competitors. There really isn’t anything like our “Elements” table on the market, and we’re pleased to be able to offer it to our clients in Minnesota. We’ve created everything from benches and tables to fire pits and fountains. If you aren’t exactly sure about what kind of design you’re looking for, we carry a selection of pre-made designs that we can customize to fit your specific needs. We are also happy to create custom focal art pieces, bubbling boulders and other water features, pergola hammocks, and pieces for your outdoor spaces. If you can dream it, we can turn that dream into a reality. To discuss your ideas or request a quote on a piece of custom furniture such as our “Elements” Fire & Water table or handcrafted stone pieces, please contact us by phone at 952-242-9368 or use our contact form to get in touch. We look forward to creating a unique piece worthy of your unique space.